Click on a Lot number for details and pricing. 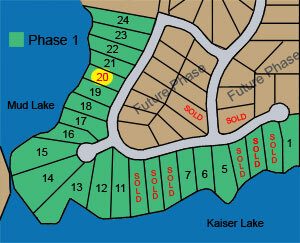 Beautiful waterfront lots on Kaiser Lake and Mud Lake. Before they are all sold, choose your favorite lot today. Photos of the beautiful homes at Serenity Shores. Call us today for information.